Our modest range of Customised Chocolates will keep your customers happy as well as helping you to keep your business details advertised during these hard times. Just choose which of our Customised Chocolate products you prefer and we'll see that they get branded up with your business details and company logo, so you be one step ahead of all your competitors. 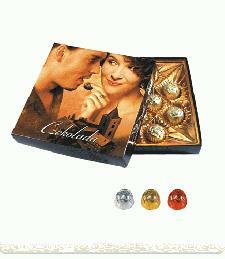 Other promotional and personalised items besides our Customised Chocolates click here. View the full rage of Customised Chocolates here. To find out more about our Customised Chocolates click here and fill in the contact form and we'll get straight back to you.